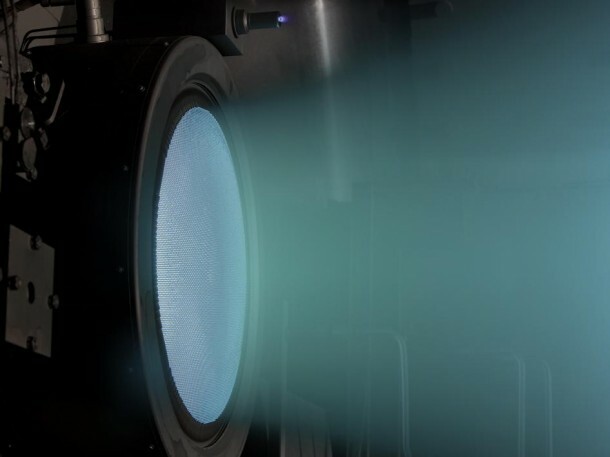 CLEVELAND — A NASA advanced ion propulsion engine has successfully operated for more than 48,000 hours, or 5 and a half years, making it the longest test duration of any type of space propulsion system demonstration project ever. The thruster was developed under NASA’s Evolutionary Xenon Thruster (NEXT) Project at NASA’s Glenn Research Center in Cleveland. Glenn manufactured the test engine’s core ionization chamber. Aerojet Rocketdyne of Sacramento, Calif., designed and built the ion acceleration assembly. The 7-kilowatt class thruster could be used in a wide range of science missions, including deep space missions identified in NASA’s Planetary Science Decadal Survey. The NEXT engine is a type of solar electric propulsion in which thruster systems use the electricity generated by the spacecraft’s solar panel to accelerate the xenon propellant to speeds of up to 90,000 mph. This provides a dramatic improvement in performance compared to conventional chemical rocket engines. The NEXT project is a technology development effort led by Glenn to develop a next generation electric propulsion system, including power processing, propellant management and other components. The project, conducted under the In-Space Propulsion Technology Program at Glenn, is managed by NASA’s Science Mission Directorate in Washington.